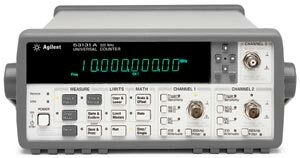 In this episode, Shahriar upgrades an Agilent 53131A Universal Counter with the OPT-030 which extends its frequency range from 225MHz to 3GHz. The upgrade kit is a replica PCB intended to emulate the behavior of the original Agilent branded option. The PCB is examined carefully with attention to microwave layout techniques along the signal path. The datasheet of all the parts are reviewed and the reverse-engineered block diagram of the PCB is presented. The expected behavior of the PCB is then measured in both small-signal and large-signal operation using an active 3GHz probe. The PCB is then installed inside the unit and the functionality of the instrument is verified within its specifications. All the documents presented in the video can be found here. Great video again and thank you very much for the effort you put in to this. Have you considered using an external 10Mhz OCXO, in GPSDO configuration, for frequency calibration source ? From what i found until now from searching the web the OXCO, for short term performance, are at least one order of magnitude better than rubidium when comparing the standard Alen deviation .SO if taken to a PLL the 1pps from the GPS ca drive an 10Mhz OCXO (divided down to 1pps) to Stratum I precision. Do you think this would be accurate enough ? Thanks for the walk-through of some of the PCB design decisions that went into the microwave daughterboard. For a software engineer like myself, it takes a lot of drilling to get the hang of analog/RF! For a time reference, I suggest you go with one of the GPS-based solutions. There are many options. I went with a Trimble Thunderbolt on a little old HP 3 rail linear supply, with a COTS Gilsson antenna, for a combined outlay under $300. Been up for a couple years now and I never have to give it a thought. Even works as an NTP stratum 1 source, with a little frobbing. One of the issues with the diodes in the amp cascade is the distortion they introduce, since they act a lot (though not exactly) like clippers. Even well below the nominal onset of limiting in a diode-based limiter, there can be a significant deterioration in the third order intercept. It’s not free. On the other hand, it beats blowing out a microwave front end, so with lab gear it’s worth learning to structure the gain in the signal path with pre-attenuation to permit use of a limiter without distortion. Hi Shahriar, I have a Trimble 10 MHz GPSDO 1 ppb source and would be glad to align the unit for you if you like. I’ve done this several times for the HP TCXO units after leaving them to normalize to the ambient temp and then with the oven on for 24 hrs. Please contact me directly if interested.